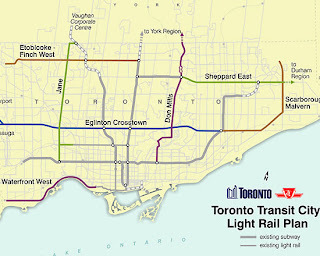 We were discussing the TTC, their relative lack of expansion over the last few years, and really transportation in general at work today. I have to say, I'm pretty excited about the street car network that was proposed a year back. I hope it gets built, but I'm a little sceptical. 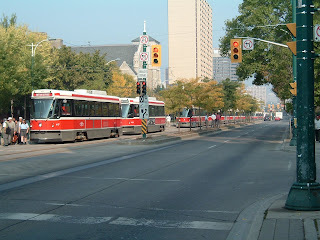 Anyway, the discussion on the advantages/disadvantages of streetcars reminded of a picture I snapped at UofT a while ago. Dedicated street car lanes definitely speed the TTC up, but a disadvantage is when a car breaks down on the tracks. In this particular case, a car broke down on the Spadina streetcar route just north of College St., the first point where cars could switch to another line an detour. So, within a few minutes, the entire Spadina streetcar fleet was held up on a narrow strip of track during rush hour. So, my friend Alex has a spanking new site, bestsporecreature.com. What is it? It's pretty self explanatory: a site where you get to vote on the top Spore Creatures! I was shocked when I heard my friends conversing about their latest Spore creatures. Not because of their bizarre creations (though they were bizarre), but because I didn't realise that this game hadn't come out and passed away yet! I'm not particularly into the new and latest computers games, I'm still not entirely sure what Oblivion is (and I don't even think it counts as new anymore), but I have heard of Spore. At least, I had heard of it several years ago when it was announced. I seriously didn't realise that it's taken them this long. Anyway, so Spore has finally released their Creature Creator, with the actual game due out in September. I will probably will never play it, and have no intention of buying it, but I must admit that it looks pretty cool. Plus, I have to make this post in a shameless attempt to help out Alex by getting more people on to his site, bestsporecreature.com. So I had my convocation today (well, I guess yesterday now, since it's after 12) at UofT. I'm officially a graduate now, degree and everything. It's nice, though a little odd, being done. 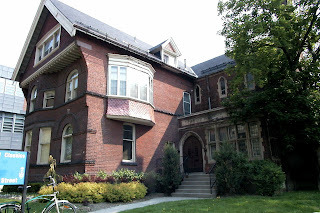 Anyhow, I'm going to take this opportunity to post a few things about UofT that I've been meaning to do for a while. I did a double major in comp. sci and classics. The classics department moved during this past semester and, I have to say, I love the new building. The Lillian Massey Building (formerly the Department of Household Science) is right at Bloor and Museum, putting it right across the street from the ROM, which I feel is appropriate. The building has been nicely renovated but still has an old and impressive feel suiting the subject. The new lecture rooms are quite nice, and the department has a lot more office space than they did at their old St. George street address. The building was used for the offices of the Ontario Ombudsman for the past few years and also leased by Club Monaco, who are still there. It really is rather amusing (at least, I feel it is), that the building houses the Departments of Classics and Club Monaco. Found this on youtube. Hilarious. Excuse the long post, but I had a really good time playing, and want to share it with everyone who cares to read. So, this past weekend was Worldwide D&D Games Day, set to correspond with the release of D&D 4th Edition. We (myself and my fiancee) decided to go and try out this 4th Ed thing at one of our local game stores, Dueling Grounds. It was a good afternoon, and I quite enjoyed the new system. I'm going to give an account of our adventure here, and likely talk about my impressions of the new system in another post. The table had 5 adventures and the DM. The was an older man there who hadn't played D&D since 1st Ed, and a young married couple who have a regular 3.5 campaign. The DM plays a lot of the miniature game, so he had a decent handle on the 4th Ed. combat rules already. A whole package was provided which included the adventure, a full poster map of the dungeon (made up from copies of Wizards various dungeon tiles), all of the minis, and some simple character sheets for the pre-generated 1st level characters. The party consisted of a Human Fighter, Dwarf Fighter, Human Cleric of Pelor, Half-Elf Rogue, and an Eladrin (I think) Wizard. There was no mad rush from anyone to play any particular character, though the older man expressed some interest in the Dwarf Fighter. In the end, I took the Rogue, and my fiancee took the Cleric. After all remarking on how many hitpoints we had for 1st level characters (I had 27), and some brief discussion on where everything on the sheet was, how to use powers, how to heal, etc., we were on our way! Two young boys had gone missing while near an old mausoleum, and their father sent us after them. 50gp each simply for taking the job, and another 50 each for finding out their fate (dead or alive). I cautiously approached the double-doored mausoleum and, after checking them for signs of bad stuff that could kill me, I opened them and we entered. Inside, after searching the single room of buried warlords for a few minutes, some sort of ghost rose out of the floor and gave us a riddle. We muddled over this for a few minutes and solved it by rearranging the statues of Pelor and Bahamut above the various sarcophagi to be in the riddle's correct order. A secret door opened and we descended into a dark crypt. We crept down the stairs to a hall forking at the end with a sarcophagus barricading each passage. Lamps were on top of each, and the air thick with the scent of oil. Two hobgoblins shot at us, and we moved in to attack. My fiancee and I quickly discovered (along with the wizard), that we were lacking the ability to roll above 5 as we all shot wildly. This continued for much of the game. The fighters both charged. The Dwarf decided to bull rush the barricade and discovered that it was filled with oil when the lamp ignited it, turning a 15 foot square into an inferno. Both the Dwarf and Hobgoblin were caught in this for two rounds. The Human fighter decided to jump on top of the other sarcophagus hoping not to spill the oil, but the top broke under his weight, resulting in him standing knee-deep in burning oil with the Hobgoblin untouched. Still, with only a few rounds, we hurt the Hobgoblins enough that they began a retreat down the halls which merged into one, again barricaded with behind a third sarcophagus. The Dwarf decided on another bull rush, this time tipping the tomb and spilling the oil on our opponents and igniting them. They died soon after. Continuing into the dungeon, we came to a large structurally unstable room with two exits. One led to the kids, chained within an obviously trapped room, who warned us that they were told that the ceiling would come down if they tried to leave. We told them to hang on and decided to check out the other room, finding an Elven Wizard standing upon a 10ft high column. We didn't bother to talk at all, and attacked. 4 Skeletons came out from behind the column and joined the battle. Again, the wizard, cleric, and myself had bad luck with the dice, with me missing with my daily attack power which would've given me combat advantage (and sneak attacks) against the wizard. Luckily, the cleric hit with Turn Undead, taking two of the skeletons out of the fight for a turn and the Shade showed up to attack the Elf in revenge for desecrating the graves. The Shade pretty much solo killed him, with an assist shot from my Rogue and the Wizard. The Dwarf went down but managed to roll a 20 on the recovery, standing back up and blowing a healing surge a turn later. The Wizard took a bit of a beating from two skeletons, but I stepped in between and we finished them off. Where was the Human Fighter during this? Well, the Elf Wizard's first action seemed to summon or animate two of the statues in the other room, which quickly approached. The fighter decided to hold them off our backs while we tried to finish the wizard. Unfortunately, these statues were the toughest opponents of the dungeon. They didn't have particularly high attacks, but when they hit, they knocked you down, each got a bonus attack as you hit the ground, and got free shots when you tried to stand up. Oh, and 80 something hitpoints. Fairly brutal. They smashed the fighter down to -16 and death, and were only slowed when the Shade shifting to attack them while we finished the skeletons. We attacked, and the Dwarf was quickly knocked out again. With the cleric out of any encounter abilities that could activate healing surges, it was just the three standing characters left. The wizard continued to roll under 5, missing with everything and did very little in this last fight. However, my fiancee and I finally found our rolling groove and came at them. She hit one with her daily power, setting it on fire and doing 5 damage a turn. This was key, as the unintelligent statue didn't stop attacking to try to put out the fire. I came around for sneak attacks, but got knocked down to 0 hitpoints on one turn. They luckily both missed the cleric for several turns as she hit them, and I used my healing surge (putting me at 6 hp) and came in for more sneak attacks. Really, I was still rolling poorly, but well enough to hit with a combination of +2 from flanking, +3 from one of her attack powers, and attacking vs the statue's Reflex instead of AC (because of one of my powers). We luckily finished them off before they could hit us again (we had only 6 and 7 hitpoints left, but the DM discovered our dice curse). Hurray! We healed the Dwarf, disarmed the trap, and took the kids back to town. Success!!!! The adventure was very fun, and everyone had a good time. Despite our poor die rolls at the beginning, we pulled it out at the end, and managed (barely) to make it through (minus one character). Everyone seemed to understand their powers quickly, and we started using different powers against different targets. For instance I had a power that attacked vs Reflex instead of Armour Class, which was very helpful (combined with flanking and sneak attack) against the statues who had rather low Reflex defenses. The fighters loved their powers, like cleave and brutal strike and the Cleric made some excellent uses of attack and healing abilities, pretty much carrying the party through the last fight (that's my girl). The DM was great and, on a whole, an awesome 3 hours that I would recommend to anyone. The repaint miniatures we got to keep.